This past several days, I have been worried about our little Andrew, my other Mom, what I was going to do going forth after 2 Scrappy Sisters closed their doors and so many other things to mention. I realize that I am to let go and give my worries to God, but I sometimes find that hard, but through all of this God has surprised me. 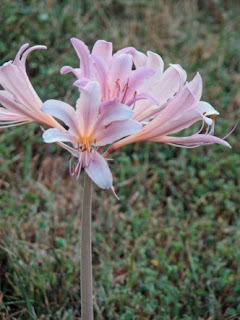 Just like this beautiful surprise lily that popped up in our back yard. I don't know how this guy got there, but I realize now that it was a beautiful surprise from God. Andrew is doing better because Melissa and David caught this infection in its very early stages, so it means that Andrew has a better chance of full recovery. He may later in childhood have to have one more operation, but it looks like he will have a normal, active childhood life. He continues to get better each day and will hopefully be able to come home later this week, but he will have to have nurses visiting him every 6 hours to administer medication for a while. It was a wonderful surprise! My other Mom hasn't had any more health problems. I taught my last class for 2 Scrappy Sisters yesterday at Stampers Ink. What a wonderful time I had seeing my scrapping friends, talking and just being together. I realize now that what I love most about teaching classes is the wonderful ladies and friends that I get to know through creativity. God has blessed me with this talent and he will be opening other doors. I only have to watch for those little surprise and blessings that God so freely gives. Poor little boy, how hard to have to go through surgery at his age. I'm so glad that he is doing better. I am so happy to hear that sweet lil' Andrew is doing well. He's a trooper! Your post today reminds me of a song from vacation bible school long ago..."Seek and ye shall find, ask and it shall be given, knock and the door will open..."
Sheila you and your family have definitely been through it the last few days. Glad everything is starting to look up. I can't believe how much hair Andrew has (from you picture in your previous post). Your family is my my thoughs and prayers.